Continuing where we left off in this ongoing series of Matthew's gospel, we arrive at the famous story of the man with a "withered hand." This story is found in the other two synoptic gospels as well (Mark 3 & Luke 6). Unfortunately, many commentators have taught this story in a manner very similar to their misunderstandings of the previous one. It has been taught as though Jesus is really concerned about "exceptions" to God's Law under the new covenant, exceptions such as acts of mercy. As a result, the Pharisaical misunderstandings of God's Law become the focal points of this entire story, when really, this section is less of a commentary on "exceptions" and misunderstandings of God's Law and more of a commentary on misunderstandings of the Lawgiver. Such was precisely the point of the previous story, and Matthew continues that thought here as well. In the previous story, Jesus is walking with his disciples on the Sabbath day, among whom were certain Pharisees. Those Pharisees upbraided Jesus for permitting his disciples to do what the traditions of 1st century Judaism had determined as unlawful. It is from that scene of traveling with Pharisees which Matthew now adds onto, only this time Jesus enters their synagogue on the Sabbath day. Even though Luke clearly says that this second account occurs on a separate Sabbath day other than the previous Sabbath confrontation (Luke 6:6), Matthew sandwiches the two stories together in order to give his readers the impression that all of these events of chapters eleven and twelves revolve around the same day of Sabbath rest. Here, on this Sabbath day and in the synagogue of the same contentious Pharisees, we read that "a man was there with a withered hand" (ESV). Actually the Greek text is much more startling than that. After entering "their synagogue," instead of focusing upon the confrontation with the Pharisees, Matthew interrupts a seemingly smooth transition into a conversation with the Pharisees by an abrupt and somewhat odd description of a man with a damaged hand. The Greek text literally exclaims: "And behold! A man having a dried-up hand!" The ESV tries to smooth out this startlingly literal translation, but in doing so they lose the original dramatic affect which Matthew intended his readers to notice. And by noticing this exclamation, many among Matthew's Jewish audience would have picked up the significance of these events. There are quite a few interesting connections with this man's particular disability. 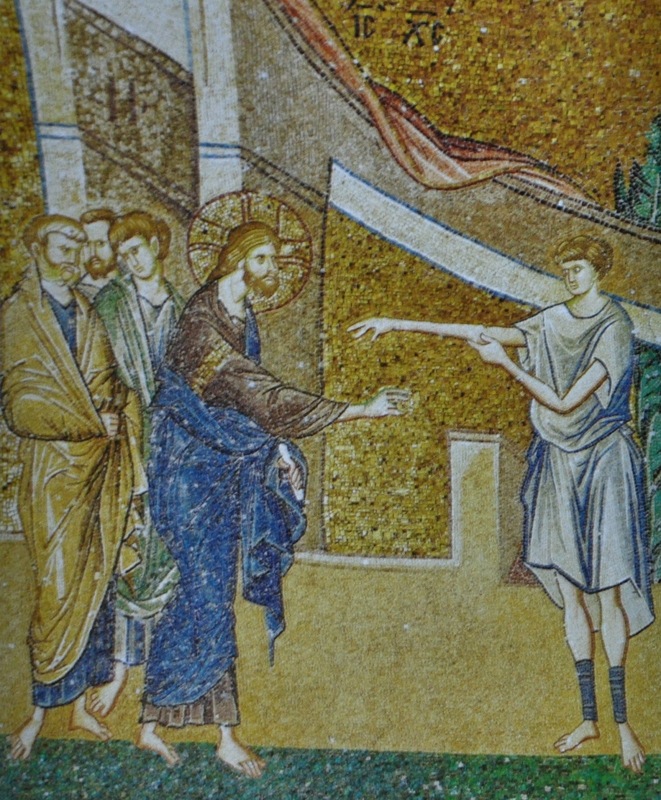 For starters, according to 1st century Judaism, such disabilities as a "withered-hand" (cheira xeran) were considered curses from the hand of God. The historical significance of this belief comes to light in the history of Israel's kings. In I Kings 13:1-6 we learn about Jeroboam and his first attempt to take the kingdom of Israel away from David's descendants and seize it for himself, and that story also involves a man with a "withered hand" (cheira xeran). In that story, Yahweh tells Solomon that the kingdom will be torn from his "hand" and given to another (I Kings 11:12, 31, 34-5). We then learn shortly thereafter that Jeroboam is that man. But in order to tear power away from the Davidic line of kings, Jeroboam attempts to divide the allegiance of the people by erecting a sacrificial altar far away from Jerusalem, in Shechem, the place where Israel first renewed their covenant with Yahweh after conquering the promised land. But after Jeroboam erects his idolatrous altar in Shechem, a "man of God" prophesies against his idolatrous grasp of power, and when Jeroboam attempts to seize the man of God, his hand withers (I Kings 13:4). Jeroboam's "hand" (cheira) on the kingdom, which Yahweh took away from Solomon, withered (xeran) as soon as he attempted to stretch out his hand against the man of God, to destroy him. In the end, Jeroboam was at least wise enough to plead to the man of God for healing, and the man of God in turn pleaded to Yahweh for healing; and Jeroboam's withered hand was restored. Woe to my worthless shepherd who deserts the flock! Let his arm be entirely withered (xeran), and his right eye utterly blinded! In Matthew's story above, Israel's leaders aren't too much different from King Jeroboam or even the leaders of Israel described in Zechariah's prophecy. They are foolish shepherds who don't care about Yahweh's sheep. In their attempt to stretch out their arms against the people of God, Yahweh pronounces a curse upon their hands. But in Matthew's account, Jesus doesn't strike out against the Pharisees by withering their hands. Instead he strikes out against the Pharisees by healing the withered hand of a man. By healing the man with the withered hand, Jesus is pronouncing himself to be the wise shepherd of Israel, while leaving them to be the foolish ones. But there is still more to this story. Notice carefully what Jesus implies in the answer he gives the Pharisees. They ask Jesus, "Is it lawful to heal on the Sabbath?" The Pharisees were hoping he would affirm their suspicions by answering publicly, so that they could accuse him afterward (Matt. 12:10). But Jesus doesn't respond by affirming that healing per se is lawful to do on the Sabbath. Instead he responds by affirming what is good to do on the Sabbath. "Which one of you who has a sheep," Jesus responds, "if it falls into a pit on the Sabbath, will not take hold of it and lift it out? Of how much more value is a man than a sheep! So it is lawful to do good on the Sabbath." By responding this way, Jesus is comparing the Pharisees to the foolish shepherds of Zechariah's prophecy. And by healing the withered hand of the man in their synagogue, Jesus also claimed to have the authority of Yahweh which the man of God appealed to when he restored Jeroboam. In other words, Jesus was claiming to be the Good Shepherd of Israel and the ruler who cares about those being destroyed, the one who heals the maimed and nourishes the sheep of Israel unto greater health. But regardless of Jesus' ability to heal miraculously as Yahweh does, we learn from Matthew's account that "the Pharisees went out and conspired against [Jesus], how to destroy him." The irony of this closing statement is great. Earlier in Matthew's gospel we learned that Jesus commissioned his twelve apostles to go to the "lost sheep" of the house of Israel, and to proclaim a soon-coming salvation for those who would follow him, but a soon-coming judgment upon those who would refuse. Also, in Matthew 15:24, Jesus will affirm again that he too has been sent, by his Father, but only to the "lost sheep" of the house of Israel. Yet the word for "lost" (apollymi) is the same Greek word used to describe the Pharisees seeking to "destroy" (apollymi) Jesus. Jesus is sent by his Father to the "lost" or "perishing" sheep of the house of Israel, but the shepherds of Israel are conspiring to "lose" him, causing him to perish. Jesus even sends out twelves apostles to represent him as they go to the "lost" sheep of Israel, but the rulers of Israel don't like the one whom the apostles represent. And so they try to destroy the Good Shepherd. According to Jesus' own argument, these Pharisees also recognize the value of a sheep that falls into a pit on the Sabbath. But the irony is that they are blind to the evil of their own thoughts--thoughts which conspire to throw the Good Shepherd into a pit of their own on the Sabbath. In this sense, Jesus is like Joseph and the Pharisees are like Joseph's brothers, conspiring to thrown their brother into the pit because their Father gave him the glorious robe of authority. In another sense Jesus is like "the man of God" and the Pharisees are like Jeroboam, attempting to seize the man of God in order to continue sacrificing in their own idolatrous temple (Herod's Temple). And last of all, in relation to the prophecy of Zechariah, Jesus is like Zechariah, called to be "the shepherd of the flock doomed to be slaughtered by the sheep traders" and sold for thirty pieces of silver (Zech 11:7-14). But unlike Zechariah, Jesus would not only be the shepherd of the flock; Jesus would also become as one of the sheep doomed to be slaughtered. But in doing so--by suffering under the hand of the evil sheep traders--the rest of Yahweh's flock is spared, and the curse of withering is pronounced upon Yahweh's worthless shepherds instead. This is very helpful! Thank you. I also note that Luke specifies that Jesus healed the man's right hand, which the Jews understood as the seat of authority. In this sense, Jesus is not only affirming His own Godly authority but also making the very dramatic statement that He now chooses to impart personal authority to the individual believer! Thanks to Jesus and His Holy Spirit upon the earth, God's people no longer need the blessing of religious "officials" to worship God in spirit and in truth. I also think Jesus was remembering the Jeroboam incident in this moment. Possibly He was redeeming the man of God from Judah in 1Kings 13 whose human errors resulted in his untimely death and ignoble burial. Christian commentators point out the holy man's failure was in being deceived by an old prophet into ending his God-ordained fasting, kind of a cruel interpretation even if it does have its lessons about rigorous obedience. (In His mercy Jesus unbinds this burden in other Gospel chapters where He redeems fasting, eating and drinking). To studious Jews, however, that man of God from Judah could more likely have been judged for his presumptuousness in healing Jeroboam on the spot, at the idolatrous altar - an evil surrounding - since even Moses never responded to Pharaoh's requests for intercession until after he had left the evil one's presence. So it seems the eternal Jesus here is healing the holy man's reputation (and trumping Pharisaic scholars), by elevating compassion anytime/anyplace to its rightful place of honor in His kingdom. Praise be to our Lord Jesus, King of Kings and Lord of Lords forever!